Coffee is the most commonly consumed drink in the US (yes, even more than water). Over 2.25 billion cups are drunk worldwide and as an industry, it continues to be a powerhouse. Coffee culture keeps on growing. People want easy and high-quality coffee from every cup. As a result, they are investing in coffee machines to satisfy their needs. It makes sense. Coffee machines are economical in the long run and make fresh coffee in seconds, what’s not to love about that? 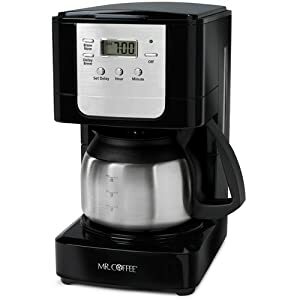 We’ve rounded up the 10 best 4 cup coffee maker machines in this article. We look at the pros and cons, some of the best sellers on the market. We also review what to look out for when you are buying a machine; whether it’s automatic coffee machines, small coffee makers or stainless steel. 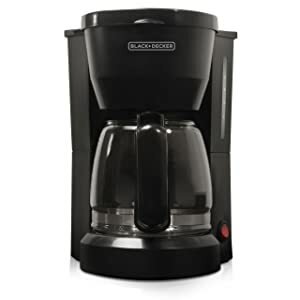 Our picks are all 4 5 cup coffee makers. They are suited to families or just about anyone who loves a good cup of coffee (or 5!). Whatever your coffee needs desire. It’s all covered below. If you don’t have time to review each machine, we have picked the 2 best options from a budget and general best pick point of view. This machine is one of the cheapest on the list but it is a high-quality product. It's easy to use and is made well. The glass carafe is solid and the hot plate kept coffee tasting fresh after brewing. It is easy to use and will serve any kitchen well. Stylish, practical and a brilliant cup of coffee. The Zutto was our top pick from a taste perspective and as a machine, it functions well. This mix of design and function is the reason it is our top pick. Yes, it is a little bit more expensive than other models, but it can’t be denied this machine packs a serious punch. The 10 machines listed have all been tried and tested by a team of coffee experts. We only wanted to include machines that are high-quality, user-friendly and of course make the best coffee around. These are our favorite on the market right now and we've compared them so you can make an informed decision when choosing the right machine for you. The Cuisinart DCC-450BK makes a great cup of coffee. It’s brews 4 cups and has the added benefit of a stainless-steel carafe with a dripless pour spout and knuckle guard. It was designed to be durable, compact, easy to use and no fuss. It’s a great budget option, comes in different colors to suit different kitchen styles and has been built to North American Electrical Standards. It boasts all the features that a large coffee maker would, but the neater design is ideal to sit comfortably just about anywhere you want it. Storage is also easy with this machine, again, thanks to its neat design. There’s no questioning this machines popularity. 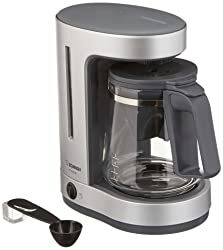 When it comes to stainless steel 4 cup coffee makers this has added features that really benefit the user, like 30-minute automatic shutoff, so rushing in the morning doesn't need to be a problem. It has a brew-pause function that can be used to automatically stop the brewing process, handy if you only want a little cup of coffee. There’s also an on-indicator light. Functionality has been considered for this product and it shows, its power saving capabilities are not to be sniffed at. The price is also a big popularity point for this product, it’s affordable and won’t blow anyone’s budget. So, if you do think this coffee machine is the one for – make sure to stock up on your filters. Also, be aware that this is one of the small coffee makers on the list and on the market right now. If you need a different style or model, keep reading. Mr. Coffee is a sleek machine. 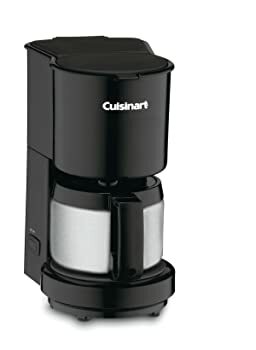 Like the Cuisinart it’s a compact size, it doesn’t have a stainless-steel carafe. But don’t be fooled, this doesn’t mean it’s lacking in other features. It has an auto-pause which allows brewing to be stopped if you need or want a cup before it has stopped brewing. There are also dual water windows so no overflows. A simple feature but one that adds an extra element of convenience to the brewing process. If you want this to serve as a single cup coffee maker, it can. But it can comfortably make 4 cups. Any coffee tried with this machine was incredibly rich-tasting and the flavor of coffee is enhanced. It’s easy to clean. The removable filter basket makes the cleaning process incredibly quick, too. It comes with a gold tone filter, so it can easily be removed and washed in the dishwasher. This saves on filter costs which again makes this an incredibly popular machine. It's cost-friendly and like the Cuisinart is a great budget price option if you want a simple machine. This machine is great for smaller households or offices but it is a basic model. You get what you pay for. Consider how often you will want to use your machine, the quantity of coffee you drink and if your preference for filters. From a 4 cup coffee maker comparison to the Cuisinart model above this is on par in terms of quality but it really depends on features you deem necessary for your own needs. This machine is one of the cheapest on the list, but the cost doesn’t mean a lack of quality. In fact, this machine has some seriously impressive features. It uses a duralife glass carafe that has an easy grip handle and measurement markings so its easy to keep track of coffee amounts. There is a removable filter basket and a hot carafe plate so coffee can stay warm. Its simple functionality includes just one on/off switch. It is a stylish design and can be hidden away easily, the cord can wrap around the unit and the machine can sit neatly in any kitchen or office. The cost is a big selling point for this machine. Also, Black+Decker are a trusted coffee machine name. The coffee pot is sturdy and has been designed to last. The hot carafe plate also manages to keep coffee hot for up to an hour. Considering the low price point of this machine, its benefits are impressive and the reason for its popularity is evident in the product itself. Yes, this is a 5 cup machine but like we said they are small cups so figure out if its right for your coffee intake before buying. Also, you can buy paper filters or a reusable filter, we would always recommend reusable ones. This is a machine for small spaces. 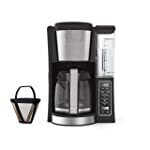 Like the Black+Decker coffee maker, this machine comes with a high-quality glass carafe that includes measurements for accurate filling. The carafe is drip-free and the machine is for 4 cups of coffee. It’s also got an easy-grip handle so pouring is comfortable. There are marks on the water tank too so it’s clear to see when it needs a refill. It’s been designed to be lightweight and small. Flavour was also a top priority when designing this machine. There’s a permanent filter included that is easy to remove and clean. This model is popular for the excellent taste and quality of the coffee. Any coffee lover will appreciate the Americano coffee style from each cup. The coffee has an authentic aroma and flavor that is hard to beat. The design helps these models popularity, too. It’s incredibly light and durable. The lack of paper filters draws people to this machine, too. We would say don’t buy this machine if you want to use it for more than 1 or 2 people. It’s best suited for small households. Also, make sure to wash the filter after each use to improve longevity. The machine comes with a 2-year guarantee so this gives peace of mind when choosing. Aesthetics are a carefully considered feature of this design. It looks great, there’s no denying it. But does it make a great cup of coffee? Yes, we can confirm it does. The Zutto coffee maker is a 5 cup machine and comes with a removable water tank. The tank includes a charcoal water filter which lasts up to 2 years under normal use. The charcoal filter adds to the purity and flavor of the coffee. The machine has a glass carafe and easy to use on/off switch. Filter cones sit inside a decanter which makes it easier to manage. Coffee is automatically kept warm, so you can return for a cup whenever you feel you need a top up. This machine is popular for several reasons. Firstly, the design. Out of all the makers on the list, it’s a sleek design and works well as an added design element to any kitchen. The quality of the coffee is obvious from the first sip, so both design and taste are huge drawing factors. Durability and ease of cleaning can also be added to the list of why this machine is popular. The design can’t be faulted from a looks perspective. The Zutto was also a dream to clean. If you’re on the hunt for style, then this is the machine for you. It guarantees to look fitting in any kitchen. There is a 1-year warranty so if there are any issues a new machine will be sent to you within the year. The machine itself is a collaboration with a Japanese interior design company, so if you prefer this type of design then we would highly recommend choosing this over the standard coffee makers. 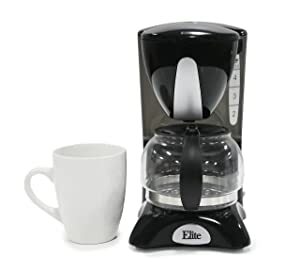 This is a high functioning maker with lots of features to suit busy lifestyles, like the delay brew button that allows you to set a timer for coffee to automatically brew when you need it. There’s also the option to choose certain strengths for your brew. This allows for a rich tasting cup of coffee. It’s a stylish model with a stainless-steel carafe that locks in the just brewed flavors. The machine has a removable filter basket There is an auto pause so you can pour a cup of coffee at any stage while coffee is still brewing. The cord can be stored in the machine to keep counters tidy and the machine automatically shuts off after an hour. It’s arguably the best 5 cup coffee maker on the list. This machine offers so many easy options for people. The sleek design and impressive functionality make it suitable for any household. The stainless carafe isn’t just any old coffee pot. The taste of the coffee also makes it hugely popular, it produces a rich-tasting cup of coffee that really enhances the coffee beans flavor. The range of options available on this machine makes it perfect for busy lifestyles. Like the brewing options. The machine can be set up to have coffee brewed for the morning. No waiting time. There is no guarantee included with this machine. It is well suited to a smaller household but not ideal for larger families. The display screen is a great feature and if you do have a busy work schedule or household this machine can save you time when you need it. This is a good basic model on the list. It’s not a fancy machine but serves its purpose well. It has a water indicator, a pause and serve function, an on/off switch and a power indicator light. The carafe is dishwasher safe and it comes with swing out filter compartment that has a built-in filter that can be reused, so paper filters aren’t required. It’s cheap and is suited to smaller households or apartments. The coffee is fresh tasting and the hot plate keeps the coffee warm up to an hour after brewing. The glass carafe has a stay-cool handle, a drip-free spout and measuring marks. The tank does, too so it's easy to monitor. The simple functionality is great for people who just want a coffee machine for basic purposes. This machine is easy to use and doesn’t require filters. It’s also cost friendly. Anyone who likes simplicity will enjoy this machine. There’s no bells and whistles, but there doesn’t need to be and that’s the reason this machine is popular. As an automatic pour over coffee maker, this one is the perfect fit for smaller kitchens. Choosing this model works well for people who are on a budget but don’t want to miss out on freshly brewed coffee. This is also an eco-friendly unit. The Bonavita 5 cup model looks stylish and high-end. It’s a little bit more expensive than other models on the list but it offers a great cup of coffee. It has one-touch brew operation. It also has an optional pre-infusion mode so if you’re grinding fresh coffee beans the ground coffee can degas before brewing for optimum taste. The model is a mix of stainless steel and plastic and a 5 cup carafe is brewed in 6 minutes. It uses cone-shaped filters. The carafe, lid, filters basket and showerhead are all dishwasher safe. It also boosts BPA-free plastic. The machine also automatically turns off. It’s a simple machine from a well-respected brand. Keeping it simple is a big part of Bonavita’s selling point and it works. 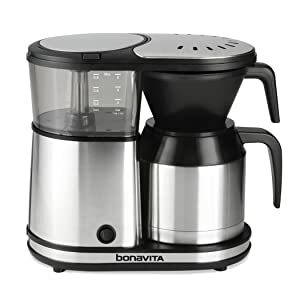 The simplicity means that each cup of coffee is consistent and fans of Bonavita know that they can expect good quality and tasting cups of coffee from this machine. There’s a 2-year warranty with this machine. The design is also sleek and tidy. It’s the ideal accompaniment to any kitchen. This machine really does coffee well. It's been built with taste in mind and it shows. It's perfect for people who savior and enjoy good quality coffee. While it is on the pricier side, which is a slight disadvantage it’s a machine for coffee enthusiasts. This machine is suited for people who want the barista experience in their home. There’s a coffee steam selector for controlled brewing and steaming. If you prefer machines with milk frothers then this is the one for you. The machine is easy to use and has a removable drip tray and a dishwasher safe glass carafe. This one is definitely for the coffee lovers. It has a water boiler and the carafe has serving sizes included so is simple to monitor. The safety boiler cap and a filter holder with a thumb guard make it safe, quick and easy to use. 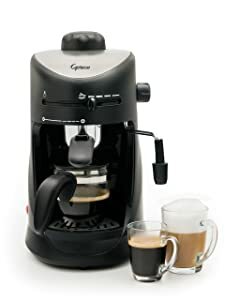 It’s a good starter machine for people who want to get familiar with espresso making and want a coffee with steamed milk. Its popularity stems from its price point. It is a cheap introduction to espresso and cappuccino's machines and easy to use. There is no warranty included with this machine. It is a plastic model with a steel upper and works with any kitchen. People who are looking for a coffee shop coffee at home should invest in this machine. For what it does the price point is fair. 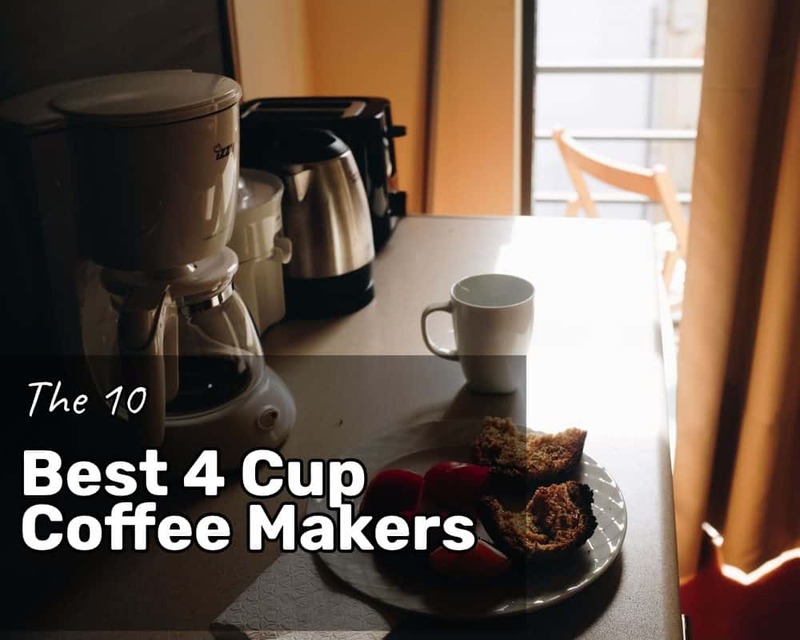 Ok, so we know this article is dedicated to 4 and 5 cup coffee makers but we get a tonne of questions about 12 cup makers, too. We felt it was only right to include at least one. So, we've chosen the Ninja machine as our personal best on the market right now. It's got thermal flavor extraction and programmable brew settings – classic, rich and small-batch brews are all possible. The small batch brews make 4 cups. Delay brew is also possible and it can be set at any time to make a brew whenever you need it. It has an adjustable heater plate and mid-brew pause so you can take the carafe out at any time and it will automatically stop brewing. The water tank is removable. Coffee is kept warm for up to 4 hours and there is a 2-hour automatic shutoff. There is a brew basket lid so coffee grounds never end up in the water tank. This machine is popular for people who need to make larger quantities of coffee. It works well for an office environment or a bigger home. The brew options are ideal for coffee lovers. Coffee is fresh and never bitter. Beans are evenly saturated and full flavor extraction is a priority with every cup. It's easy to use and the carafe can be easily pulled away mid-brew. It doesn’t burn coffee and keeps it tasting fresh. 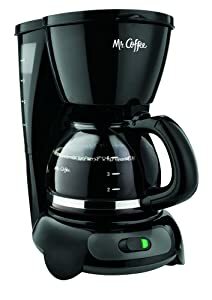 There is no warranty with this machine but it is an excellent 12 cup maker. 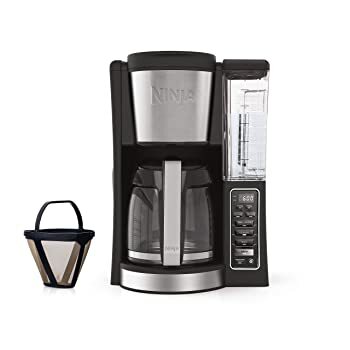 Any household or office that needs a bigger coffee maker should consider the Ninja. This article focusses on 4 5 cup coffee makers so if you are in the market for one of them, great. But before you buy think about what you want the machine to serve as. If you want to use it for a medium sized office, then choosing a smaller model probably isn’t the right move. Think about what material you want and if the plastics used are BPA free or if a glass carafe would suit your needs better. Do you prefer stainless steel models? What would work best with your kitchen design? These are all factors that should be carefully considered before jumping into any purchase. Also, if you are looking for a more eco-friendly option consider the filter system, and buying a machine that has a reusable filter. Only buy within your budget. Set a budget before you start looking and then only look at machines that fit that range. It can be easy to get sucked into buying a more expensive model because of all the features but that doesn’t mean it’s the right machine for you. 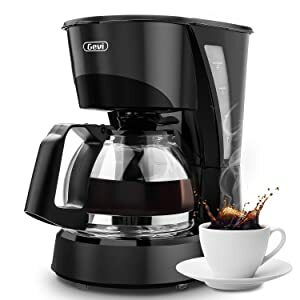 If you are looking for a simple coffee maker make sure it is easy to use, usually these machines have a simple on/off function and don’t require a manual. If you want a multi-functioning machine then research before buying. You don’t want to end up with a coffee maker that you have no clue how to use. Check it is easy to clean, how the water filling works, the maintenance process and generally how you will manage it on a daily basis. Always Wash Removeable Parts After Every Use – This might sound obvious but if you're in a rush it can sometimes be forgotten. All removable parts should be washed with hot soapy water after every brew. If they are dishwasher friendly pop them in the dishwasher on your way out of the house. If they aren't taking the time to wash them. Honestly, your machine will thank you for it. Use White Wine Vinegar – Machines need to decalcify to stop the build-up of hard minerals. Using vinegar can help keep the machine in brand new condition. Fill the water tank with half vinegar, half water and if you use paper filters put one in. Set your pot up to brew and use the machine as if you were making a cup of coffee. When it is complete repeat the process using the hot water/vinegar mixture. When this cycle is finished clean everything with hot soapy water. Then, run another two brew cycles but with fresh water this time. This makes sure that all the vinegar residue is gone. Use Lemon Juice – This is a great alternative to vinegar and contains the same level of acidity. Run a brew cycle with water first to get out any leftover coffee. Then fill the water tank with half lemon/half water solution. Leave to sit for 15 minutes. Put a filter in and turn the machine on. When this cycle is done run a cycle with fresh water once or twice. Then to finish washing all the detachable parts with hot soapy water. Use Rice for Your Carafe – Want to make your carafe shine? Even if you do clean your carafe after every use, they can get a little on the grubby side. Add hot soapy water and a little bit of rice to it. Swirl the mixture, this will loosen any of the dirt that has built up. You can also use a sponge and give it a good clean with the mixture included. It will leave your carafe looking like you have just taken it out of its box. Choosing a good 4 to 5 cup coffee maker is never easy. It takes research and careful consideration. With a little bit of intel, it doesn’t have to be difficult to make the right choice. We hope this comprehensive guide will help you in choosing a machine that is suited to your needs. It’s hard to beat a fresh cup of coffee and the machines we have picked all guarantee a good cup to start your day, or for whenever you need it. Good luck on your hunt.